Each Monday I highlight other bloggers or web contributors who are making important or interesting contributions to climate, sustainability, transportation or market transformation. Check back each week for another installment. Miles Grant is a fellow Arlingtonian who shares a strong interest in protecting and improving our environment. He is also an assiduous follower of politics--both local and national, with a particular interest in Virginia state politics. His blog, The Green Miles, reflects both of these, with posts that address one or the other or, often, both. Mr. Grant ran for state delegate in 2009, but lost in the local election. He works for the National Wildlife Federation, where he also maintains an active blog focusing on issues specific to that organization. Keep an eye on Miles. It's my hope that he and people like him will be politically successful to help push more progressive environmental policies at a faster pace. Shareable is a blog that studies the societal and economic opportunities that arise out of networks of sharing. Sharing has become a more talked-about topic of late, and there are more and more companies offering sharing products and services, including Zipcar, B2B Rentals (apartments), Bikesharing, Wikipedia and others. Media has also been covering it, including Fast Company, The Wall Street Journal, and the New York Times. This is the kind of idea that will help us Transform to Sustainability, the name of this blog and the idea that major and transformative changes are needed to create a sustainable future. Why does every house need a lawnmower for use about 30-40 hours per year? Or a power drill that might be used 3-4 times a year or less. The amount of "stuff" that is created just to sit around mostly unused can be viewed as a tremendous resource, and Shareable is looking how that resource is being deployed and exploited. Personally, I belong to Zipcar and Capital Bikeshare, and I have used B2B Rentals when traveling. I'd love to jettison more of my seldom-used stuff if I knew I had access to shareable resources when needed. Check it out: Shareable.net. and many, many more. Coverage of topical issues, like the COP16 meetings in Cancun is strong and complete. Whatever your issue of interest, you are certain to find one or more bloggers at NRDC who write interesting and insightful posts on it. Enjoy! The Washington Post ran a long investigative article about Pepco, the local utility that serves Washington DC and the nearby Maryland suburbs. It took Pepco to task for its lousy reliability and exposed its weak excuses (and outright lies) about its reliability problems. Pepco ranks among the worst utilities in the country for number and length of outages. Read the article here. Also check out the associated links for more information. The problem with utility reliability is that the costs of outages are primarily borne by the customers--they are externalized from the utility. The only costs utilities pay are a tiny loss of revenue and the chewing out they get in the press. The difference between a 1-hour outage and a 5-hour outage may cost Pepco a dollar or less in lost revenue, but it might cost a residential customer a refrigerator full of food. I recall after Tropical Storm Isabel came through in 2003, I walked past my nearby Baskin-Robbins about 24 hours after the power went out. They had to throw out their entire inventory of ice cream: thousand of dollars worth. They were just one of thousands of businesses that suffered major financial losses due to the power outages from that storm. The article mentioned that some customers are spending $9,400 to install natural gas-powered generators in their homes. If 10,000 customers do that, it's a total expense of $94,000,000 incurred by them to reduce the risks associated with outages. Unlike, say, cell phone service, customers cannot choose to switch to a different utility for their electric distribution service, so there is no competition to raise the bar for reliability. Pepco is regulated by the public utility commissions in DC and Maryland. The simplest way to get Pepco to make improvements is for these commissions to internalize the costs of outages with a simple mechanism. The utility commissions would build into Pepco's rate case the expected costs to the utility for achieving "average" reliabilty based on regional or national statistics. Or to return to their own reliability rate from 2004. If Pepco exceeds that, then their investors would reap extra profit; if they fall short, their investors pay. This is fair, since the customers who are directly affected are the ones who get the reimbursements if Pepco falls short, while the customer base as a whole would pay a slight premium for increased reliability if they exceed the goals. The commission could set the bar anywhere they like. One idea would be to expect them to achieve "average" by 2015 and then increase the reliability expectation by some percentage each year, incentivizing Pepco to continuously improve. What about "Acts of God?" I would propose that there are no "Acts of God." It's up to the utility to prepare for big storms and other large-scale disruptions. This is, in fact, the business they are in. Hopefully the risk of enormous payments would get them to start looking more seriously at undergrounding, redundancy, smart grid and other risk abatement strategies. They could purchase re-insurance for major losses. That would be good, because the re-insurer would likely be tougher on Pepco than the PUCs, since they would be scrutinizing Pepco's actions to make sure they reduce their own risks. This customer rebate mechanism is very simple and easy to understand. The financial incentives are exactly aligned with the desired outcomes. The utility is rewarded for exceeding its goals and penalized for falling short. It incentivizes them to go beyond the minimum and look for creative solutions. For the last five years, Pepco has gotten fat and happy while allowing its reliability to go to pot. Sure, they've had a couple of uncomfortable press conferences, but no real penalties. A mechanism like this would keep them from ever letting it happen again. Deutsche Bank Climate Change Advisors is one of the leading climate change investors in the world. From my perspective, however, the key role they play is as a word of reason from the business side of the ledger. There are so many old-line businesses: industry, banking, manufacturing, etc., that are often pushing against taking strong action on climate change. DBCCA is the opposite. "Deutsche Asset Management identified climate change as one of the mega-trends that would drive the global asset management business for the next generation and beyond. We saw that the rapidly growing level of carbon in the atmosphere meant that the world had to take action now, and that this would require massive capital investment over several decades. That in turn would produce exciting new investment opportunities from which our clients could benefit." I receive an email when new research comes out from DBCCA. I was not able to find a place on their web site where you can sign up. If you are interested, though, try sending an email to Bruce Kahn, and he will put you on his list. Plans to rebuild two intersections along the Fairfax County Parkway at Fair Lakes Parkway and Monument Drive--adding ramps and interchanges--fail to make pedestrians or bicyclists welcome. VDOT is planning to rebuild the intersections of the Fairfax County Parkway at Monument Drive and Fair Lakes Parkway (map). They will eliminate the intersections, replacing them with bridges and ramps. The detailed plan is available here (pdf, 9.3M). Robert Thompson discussed this project in an article in the Washington Post on Saturday, and details can also be found on the VDOT web site. It includes this language: "Shared-use paths and sidewalks will enhance pedestrian access at the interchange and to the Rocky Run Stream Valley Park trail system." Since I am not personally familiar with this area, it may be true that they are improving the current situation, but that would only be because it must be really bad now. Although sidewalks and shared use paths are included in the project, this will be a dauntingly scary place to be either a cyclist or pedestrian. This is obvious from the artist's rendering of the project, in which it is virtually impossible to make out any pedestrian or bicycle infrastructure. The artist's rendering nicely details traffic flows, lanes and other automobile-related details. One can make out some sidewalks, but it's not at all clear how they are supposed to connect or how one could safely use them. The buildings in the lower left in the rendering are currently a Residence Inn. There is an office building shown on the lower right that one could probably hit with a golf ball from the Residence Inn. Although one could ostensibly walk from one to the other, it seems that the Fairfax County planners have not given much thought to actually making that a feasible option. Looking at the detailed pdf graphic, it appears that pedestrians will be required to cross at least three slip lanes (one of them an acceleration slip lane) with no signals. They will also be required to walk under a 6-lane wide bridge next to eight lanes of traffic--a rather unpleasant experience one can imagine. It's understood that VDOT is trying to make the Fairfax County Parkway more and more of a limited-access highway, and their goal is to move more cars at higher speeds and greater capacity than before--for better or worse. However, it's large projects like these that provide an opportunity to think more creatively about accommodating all modes. Particularly as bicycling is growing in popularity, it is important to create easier and safer ways of crossing barriers like these. 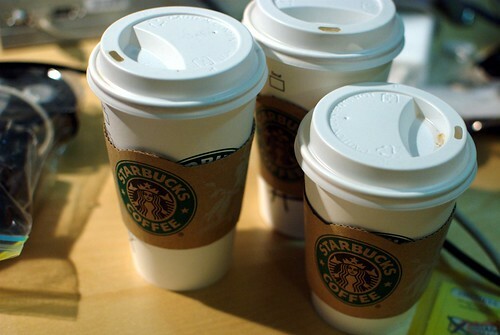 A recent article by Anya Kamenetz in Fast Company magazine highlighted Starbucks' efforts to reduce its waste stream. It particularly looked at the problem of the billions of its coffee cups that are discarded every year--three billion according to the article. 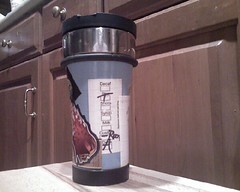 Much of it focused on how to re-engineer the cup so it could be recycled or composted. It's difficult to do so, because the cup has to be made of materials that will withstand the heat of the coffee and also be in contact with a potable liquid. A few pilot programs are under way. Blah blah blah. Starbucks, to its credit, has made reusables part of its strategy; it sells tumblers and offers a 10-cent rebate for customers who bring in their own. Yet a paltry 1.5% of drinks are actually served in reusables. That's 3 out of every 200 customers. This writer, Andrew Teasdale in Vancouver, blogged about his local shop, where it was a much better, but still pathetic, 5%. I might edit out the words, "to its credit," in the above sentence. . .or question the use of the word "strategy" to describe their ineffective efforts. No way. Not even close. In fact, I don't think they are even trying. 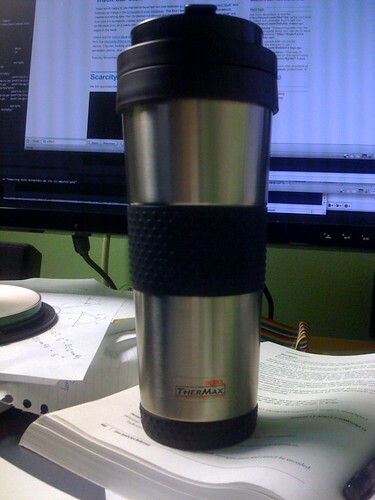 I virtually always bring my reusable mug with me, as I posted once. My point here, though, isn't to evangelize. We've all heard that before. Although they offer a 10 cent discount for your own cup, they do not market it at all. When it even appears on menus, it's way at the bottom in the smallest font. Go ahead, look the next time you go and see how inconspicuous it is. I've never seen any point-of-sale about this promotion: no signs, posters, stickers, buttons on barista's shirts. . .nothing. I've never heard of them trying any kind of marketing or other effort to increase this. I may have missed something, so let me know if you have. The baristas do generally know. Only about 5% of the time do I have to remind them to give me the discount. So there you go. Starbucks set a goal just a couple of years ago, which they have clearly abandoned without really even trying in my opinion. Even if they come up with some sort of cup that doesn't have to be thrown out, reusables are still vastly superior, so they need to be promoting their use regardless. Come back soon for a follow up post with some ideas about how they could boost that percentage.